Every so often I like to take some time to get to know the authors of the books I read just a little bit better. Lately I haven't managed to find the time to do much of this, but last week I was able to poke around the web a bit and learn about Joan Aiken, the author of this month's classics book club read, The Wolves of Willoughby Chase . Aiken is an interesting character, to be sure. To begin, she was born on my birthday - September 4th - in East Sussex in 1924. (I guess, technically, I was born on her birthday.) Her father was the famous American poet Conrad Aiken and her mother was Canadian-born Jessie MacDonald. Joan's parents marriage was dissolved when she was five years old. Her father remained in England for a time but eventually moved back to the U.S. Her mother married an Englishman and Joan lived with her mother and her new husband. 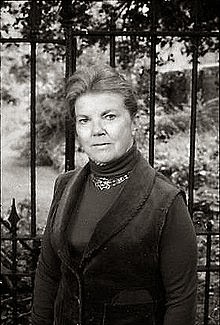 Joan Aiken was home schooled for the first twelve years of her life, after which she attended Wychwood School for Girls in Oxford. Like her father before her, Joan had a knack for writing and frequently penned short stories. She said she began writing on her fifth birthday, always working on new stories. Her first short story for adults was accepted for publishing when she was 17 years old. (Not bad!) All told, by the end of her life she had published over 100 books so if you have enjoyed reading The Wolves of Willoughby Chase you'll be delighted to know that there are many more titles to choose from, including several in the Wolves Chronicles. Aiken is noted as having a special gift which enabled her to write for people of all ages. That to say, her children and her adult books are both well-received. She enjoyed writing for both age groups, noting that the difference is really only in adding in thought-processes, descriptions and flash backs for adult readers. I definitely had the impression when reading The Wolves of Willoughby Chase that it could have been expanded and deepened into an adult novel, but I think it worked very well as a story for children. Besides writing novels and short stories, Aiken also wrote poetry and plays. Some of Aiken's favorite authors included: E. Nesbit, Charles Dickens (her mother read Dickens aloud to her when she was very young), Francis Hodgson Burnett, James Thurber, Edgar Allen Poe, ghost story writer M.R. James, and Fitz James O'Brien who is considered a forerunner in the science fiction writing category. Aiken married Ronald George Brown in 1945 and the two had two children. Brown died in 1955. In 1976 Aiken was remarried to a New York landscape painter and teacher, Julius Goldstein. Those two then divided their time between New York and England. Goldstein passed away in 2001 and Joan died in 2004. Her two children from her marriage to Brown survived her. I definitely enjoyed learning a little bit more about this author and I hope you've enjoyed these discoveries as well. If you know of anything else that is notable, please do mention it in the comments below! FUN! I do enjoy your author notes. I'm intrigued that she liked Poe. My copy at the library is in today! AND Fitz James O'Brien ! I enjoyed reading this even though I decided to pass over the Wolves book for the book club this time. Maybe I'll come back to them another time.